Jack in the Box aims for your sweet tooth this winter with the debut of three new peppermint-flavored desserts. - Peppermint Iced Coffee - The chain's iced coffee with white chocolate peppermint syrup stirred in. 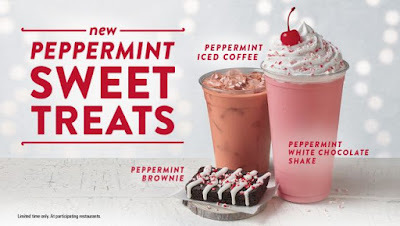 - Peppermint White Chocolate Shake - Ice cream blended with milk and white chocolate peppermint syrup, crowned with whipped topping, bits of peppermint bark, and a maraschino cherry. - Peppermint Brownie - A fudge brownie with peppermint bark pieces baked in, finished with a drizzle of cream cheese frosting.